To start an empty default Logic Pro project, choose File→New or press Shift+Command+N. A New Tracks dialog window opens. At the top of the screen, choose the type of track you would like to begin working with and then click Create. A more advanced and customized way to start a new project is to choose File→New from Template (Command+N). The Project Chooser window opens. You can select a premade project template, a recent project, or your own customized project template. Click Details (on the left) to display even more options for your new project, such as the tempo, time and key signatures, and audio input and output. You can change any project option, but you should stick to a single sample rate. The default sample rate, 44.1 kHz, is used for CD quality audio and is the choice recommended to all beginners. The 48 kHz sample rate is often used in video projects. Using higher sample rates depends on your hardware capabilities and project needs. After you start your project, you’re ready to begin recording, arranging, editing, and mixing. It’s a dream come true. 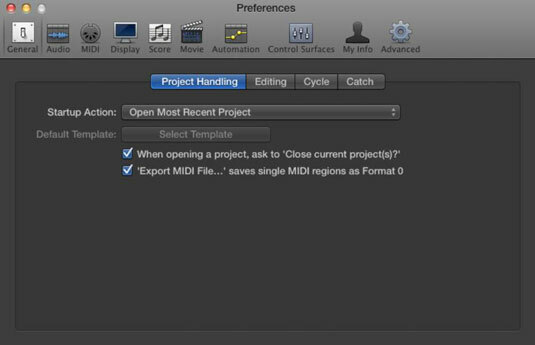 Choose Logic Pro X→Preferences→General and select the Project Handling tab. 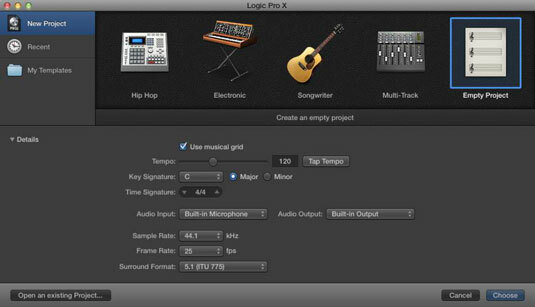 Choose a custom startup action to tell Logic Pro what to do when you launch it. If you’re the prolific type, you can create a new project every time you launch the app. You might want to open the most recent project on startup. Select your startup action. Logic Pro is kind enough to ask you what to do when it starts.